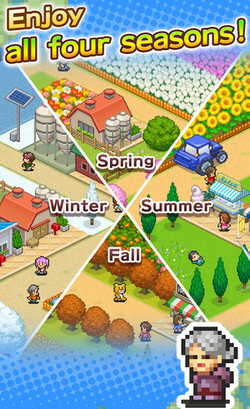 Get your farmer mind on to succeed in Kairosoft's latest simulation. 8-Bit Farm (hack included) is a farming management game where you get to grow a small farm into greatness. You will need to get livestock, grow various plants, expand your lands, hire staff, and prepare your fields for agritourism. Enter a variety of contests. The key to winning is raising the levels of your produce and skillful placement of farm facilities so that they work together as combos. A prize-winning farm is certain to attract even more visitors! Receive photos as gifts from happy visitors or for completing achievements, and exchange them at the FarmMart to obtain a wide range of installations for your farm. Photos can also be traded at the Odds&Ends Shop for handy items such as gadgets which influence the weather. 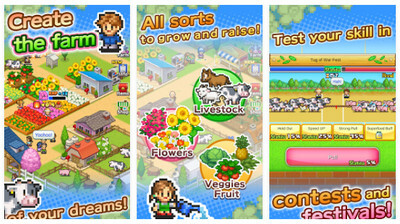 You can free download 8-Bit Farm APK on our site from links below. But we encourage you to buy the game from the official Google Play page and support the devs who made it. A Mod with unlimited money (infinite coins) and photos has been added so you can enjoy this simulation even further with infinite possibilities. Players can also participate in festivals competing in fun mini-games such Tug of War, Sports or puzzles. If you win, you will get money and hats for your workers. You will also need to prepare your farm for the yearly National Farm Ranking where sales, number of visitors and their satisfaction, and number of staff are all key factors to winning the competition.